On the December 23rd drive down to spend the holidays with my family, I could feel a sore throat starting to develop. Due to the way I eat and take care of my body, it’s very rare for me to become sick. Whenever I do become sick, it normally lasts for 5-7 days. What starts out as a sore throat morphs into a nasty cough, which then morphs back into an even deadlier sore throat. By the time we arrived at our destination, I knew I had a battle ahead of me. That was the last straw! In addition to last week’s emergency situation I had to put out, my illness was just another stressor! I just wanted to relax. I told myself that I was just going to have as great a birthday and Merry Christmas as I could, while avoiding getting my other family members sick! So that’s exactly what I did. I totally embraced the holidays! No holds barred! I ate, drank and took cold/flu pills for almost an entire week. I could feel my waist getting bigger. 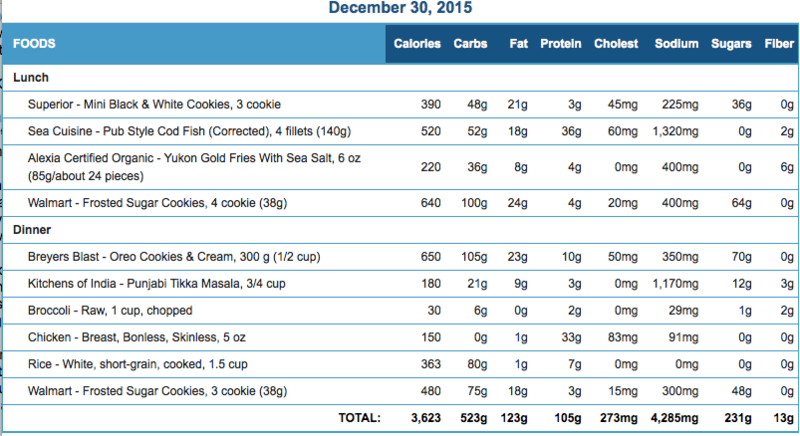 Normally I wouldn’t record what I eat during the holidays, but this year I made sure I recorded my bad eating habits. I wanted people to see just how easy it is for me to gain weight if I don’t stay in control. NOTE: If you need to skills to stay in control check out my book, Release The Beast: Conquer Mental, Physical & Diet Challenges To Unleash The Champion Inside! and gain the confidence you need to live in the real world!! On December 18th I had a scale weight of 201.4 pounds with a 34 inch waist. In less than two weeks, I had gained 16 pounds and 2.5 inches on my waist! The majority of those 16 pounds occurred during this past week. 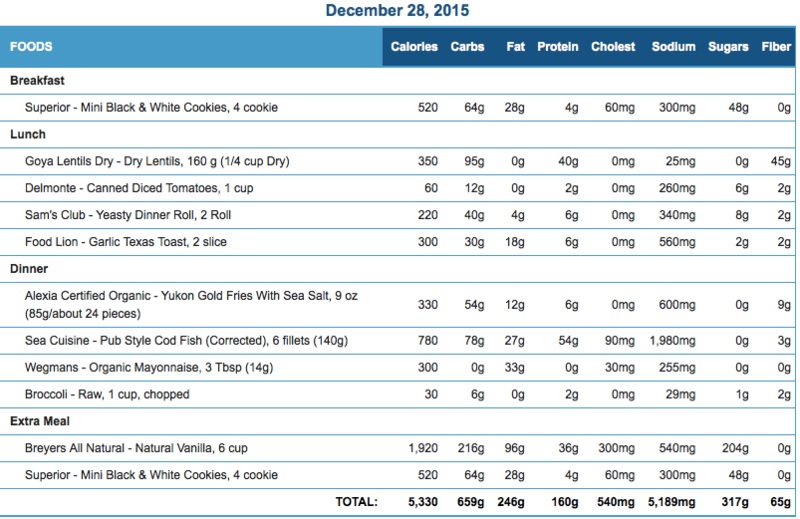 My 2015 goal was to lose 15 pounds of fat by getting my scale weight down to 195 pounds. Judging by my final numbers, it looks like I didn’t meet my goal! Should I just accept that I’ll never lose the weight? As I type this on January 1st, 2016, I am no longer in the year 2015. Should this one week define my whole 2015? You see that’s where I’m a lot different than most folks. I’m not going to have a pity party for myself. Sure it would have been nice to get down to 195 pounds in 2015, but there’s more to this story than just weight loss. 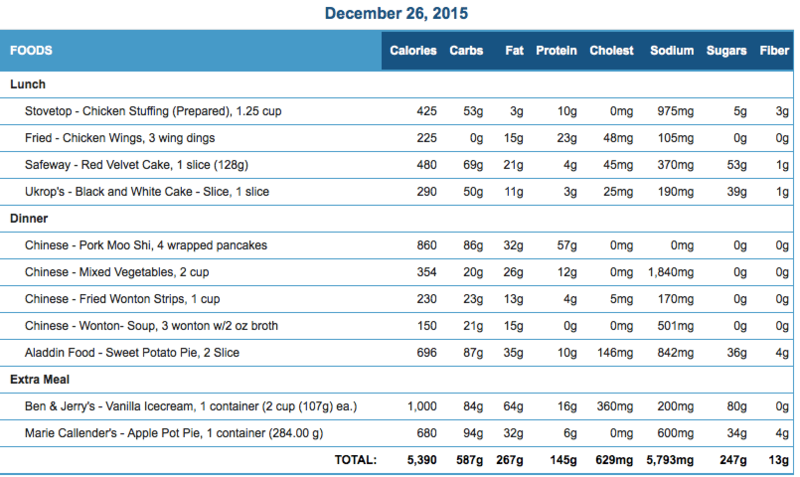 I attempted to do a fat loss during the HARDEST time of the year for myself. That’s why I’m so proud of myself. From Thanksgiving until New Years, I kept track of EVERYTHING I ate. The good, the bad and the ugly got recorded. I’ve never done that before. I have been on this earth for 35 years now. There’s no doubt in my mind that the holiday season is the toughest time for me to lose weight. I just look at a cookie and I’ll gain weight. That’s how carb sensitive my body is to sugar/flour. That’s something I’ve come to accept as my reality. GOT TO KEEP MOVING ON! I had my holiday fun and I’m now over it. My illness is also starting to leave my body. It’s time to get back towards my goal of losing 15 pounds of fat. 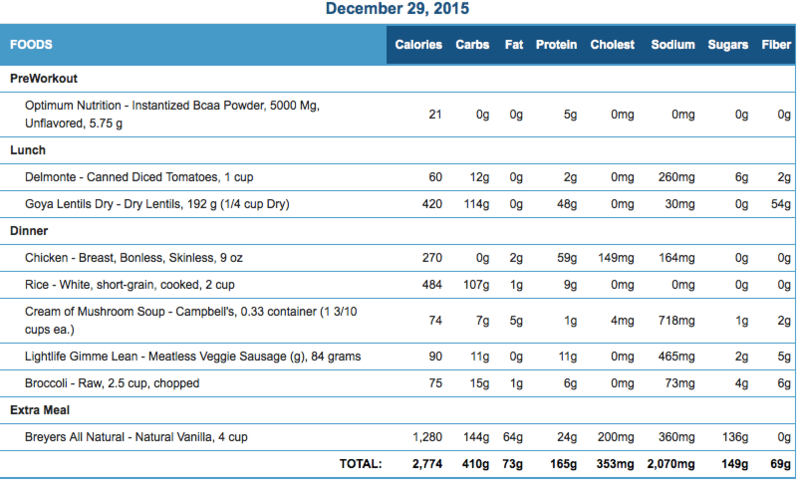 As I return to my normal diet routine this week, I guarantee that my numbers will drop back down to “normal”. Don’t believe me? Check out my January 2015 stats. Drop scale weight from 217 to 210 pounds. 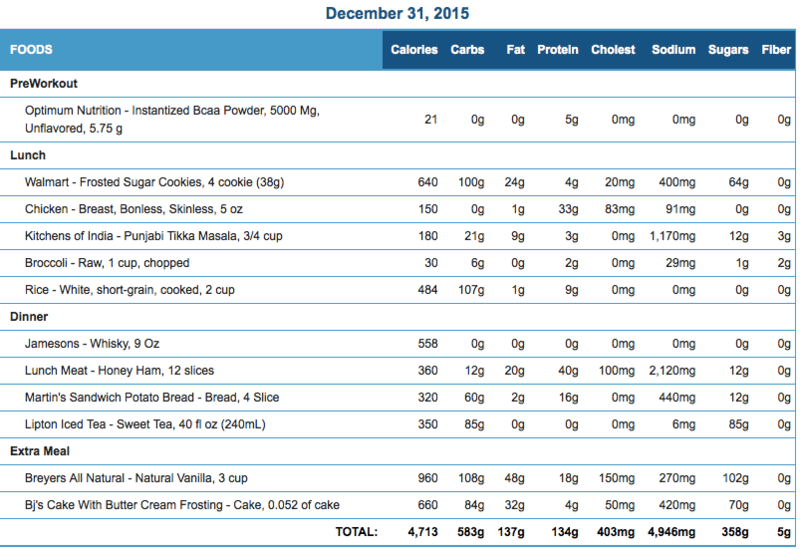 It would have been awesome to have achieved my goal of losing 15 pounds in 2015. There were many months in which I didn’t try as hard. I can’t go back and change what I did. All I can do is control what I put in my mouth one day at a time. That’s why I’m not giving up with my goal of losing 15 pounds. I’ve said it time and time again, I DO NOT CARE HOW MUCH I WEIGH! I honestly think 195 pounds is too thin for my current body frame. I could use some more muscle. BUT before I go on a massive muscle mass building diet routine, I want to drop as much fat as possible. That’s why I still see value in getting down to 195 pounds, and finishing what I started in 2015! 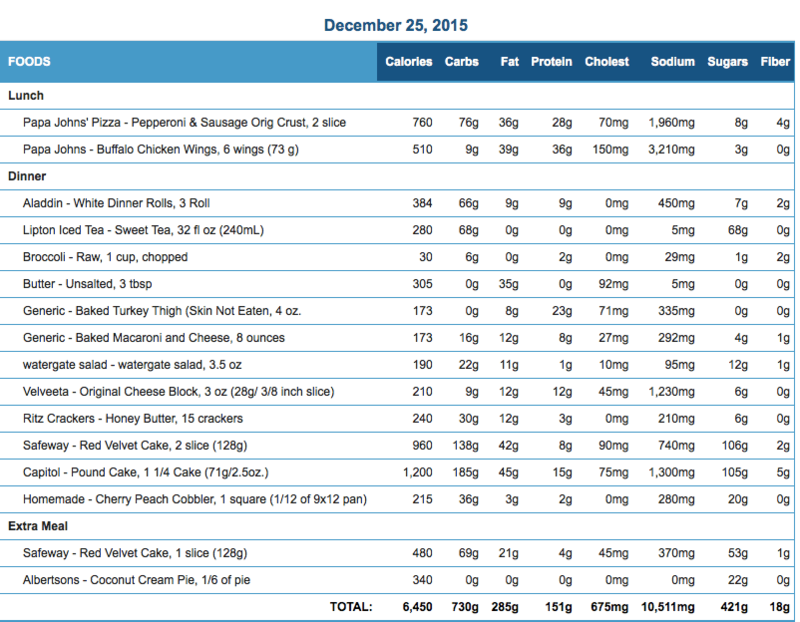 Next Next post: How The 2015 Holidays Shattered My Progress But Not My Goals!